Goodyear has announced the return of its global brand icon as it continues to educate motorists on the importance of road safety. The Goodyear Blimp will take flight from mid March until July to embark on a nationwide tour in support of the tyre brand's planned road safety initiatives. Named the Spirit of Safety, the airship will deliver road safety messages as it underlines the importance of The Highway Code with particular emphasis placed on young driver education. A renewed media partnership with Sky Sports will also reach out to a worldwide sporting audience as the Goodyear Blimp flies over major Premier League football matches as well as International cricket, golf and rugby. "We are delighted to bring back the Goodyear Blimp as it takes the lead on a number of road safety initiatives. The Blimp is an integral part of our ongoing communications with drivers and their families as we look to promote the importance of tyre safety with motorists." 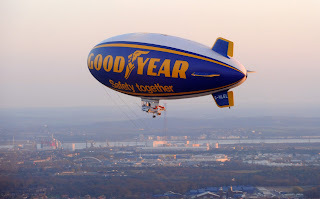 The Goodyear Blimp has graced the skies for more than 85 years. It has established a reputation for being a "guardian angel" for the brand, which symbolises the work of Goodyear's innovation centres to help improve road safety. To find out more visit www.goodyearblimp.co.uk.